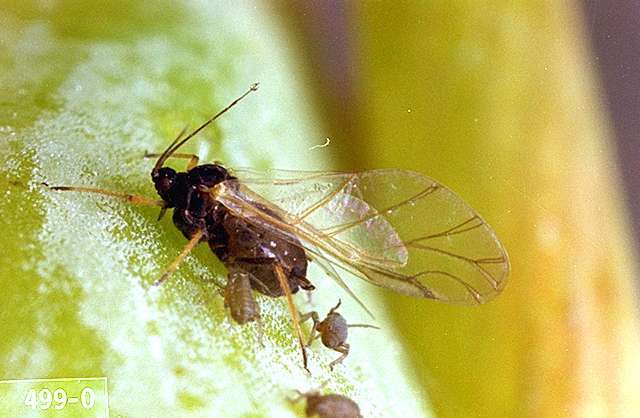 Pest description and crop damage The bean aphid is dark olive green to black with light-color legs. It is usually more of an early-year pest. Aphids damage plants by sucking plant sap, which causes heavily infested leaves to curl and stunts plants; excreting honeydew, which causes sticky, shiny leaves to turn black because of a sooty-mold fungus growth; and spreading plant diseases. Infestations frequently are localized; heavily infested leaves curl down. imidacloprid (Admire) at 0.16 to 0.38 lb ai/a soil or 0.047 lb ai/a foliar. PHI 21 days soil; 7 days foliar. REI 12 hr. Do not exceed 0.38 lb ai/a soil or 0.24 lb ai/a foliar per season. insecticidal soap (M-Pede) at 1% to 2% solution. See label for gal/a. PHI 0 days. REI 12 hr. malathion (Malathion 8) at 1 lb ai/a. PHI 7 days. REI 12 hr. Retreatment interval 3 days. Limit 5 treatments.